International shipments will require additional postage. Please see Shipping section at the bottom of the page. Hi-Vis fluorocarbon in sizes 2 and 1.5 is available again! 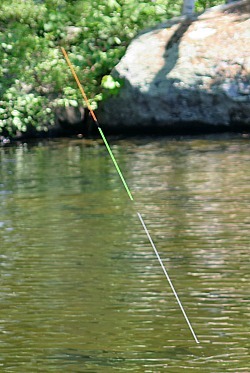 The YGK line is a salt water fishing line rather than a tenkara line. 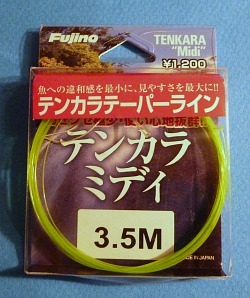 It works great for tenkara and comes with 150m on a spool. That ought to be a lifetime's supply. Fluorocarbon line casts more easily than nylon, even in these sizes. 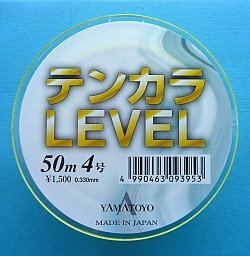 The Sanyo Valcan line is a lo-vis "stealth" fluorocarbon line. It is a light milky green color. You can see it easily against dark water but fish cannot see it easily with the bright sky as a background. I've waited a long time to get a Hi-Vis size 2.5 line. I think Nissin's new Oni Tenkara line will prove to have been worth the wait. International shipments will require additional postage. Please see Shipping section below. 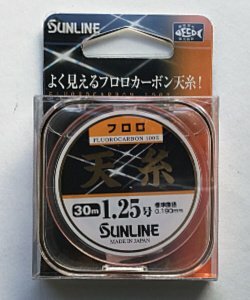 The Sunline Tenkara Buttobi (pronounced boot-toe-bee) Fluorocarbon 100% Level Line is a Hi-Vis fluorescent orange tenkara line that is extremely visible. In low light conditions it almost glows. 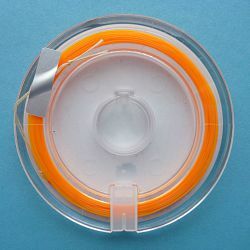 The line is packaged on 30 meter spools that are about the size of tippet spools and come with an elastic band similar to that on the Varivas tippet. Available in sizes 3, 3.5, 4 and 4.5. 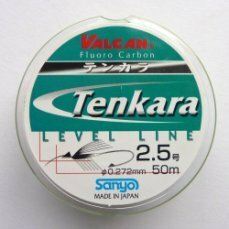 The Yamatoyo Tenkara LEVEL line is a fluorescent chartreuse fluorocarbon line. Against some backgrounds, this line is more visible than the orange line and against some, the orange line is more visible than this line. The Yamatoyo line comes in sizes 3, 3.5 and 4. 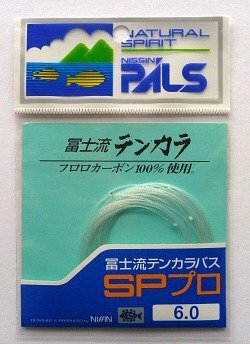 The Nissin PALS Fuji Style Tenkara SP Pro lines are twisted tapered fluorocarbon tenkara lines made personally by tenkara master Hiromichi Fuji. The combination of fluorocarbon and the taper make them cast like a bullet and turn over beautifully. Anglers who prefer furled lines will love them. Anglers who prefer level lines will admit that they have their place. They cast into a breeze better than a light level line, have the mass to turn over a bulky fly like a Wulff or a hopper, and match nicely with the stiffer rods. The longer lengths also work nicely for the longer keiryu rods. The method for attaching the line to the lillian is completely different than for any other line. Please see the "More info..."for instructions. 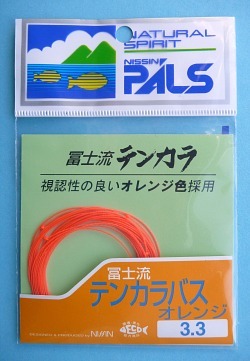 The Nissin PALS Orange tenkara line is similar to the Nissin PALS SP Pro twisted fluorocarbon line. 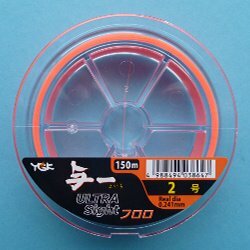 It is a tapered, twisted multifilament line, but instead of clear fluorocarbon it is made from very hi-vis orange nylon. It doesn't have the density of fluorocarbon, but it has all the other advantages of a tapered twisted multifilament line. When I took the White Tenkara line out for the first time I decided I really liked it. It is visible enough to see. I didn't fish it in late evening or deep shade, when you might want to switch to the bright orange Soft Tenkara. It is also likely to be a lot more stealthy. I don't think brightly colored lines scare fish, but I know some people think they do. This line, with the sky as a background, should be almost invisible to the fish. Fujino Midi Soft is a newly introduced line that has the color of the original Midi line and the taper and nylon formulation of the Soft line. 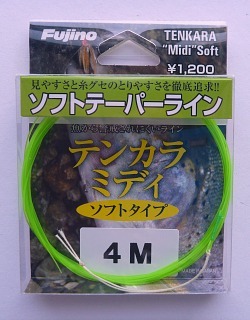 The Daiwa Tenkara Floating Line is a thin (.024") monofilament core PVC fly line. 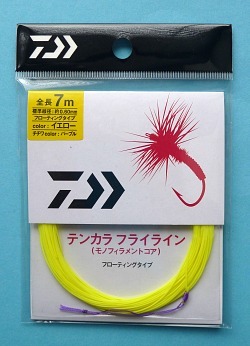 Daiwa even calls it their Tenkara Fly Line. At the Oni School in Salt Lake City, Tenkara no Oni cast a 10 meter line, and then had the students casting a 10 meter line! I prefer to fish with shorter lines, but the Fujino Soft Tenkara Long Type that Oni used at the school is an excellent training device. With good form, you can cast a 7, 8, or 9 meter line. With bad form, you can't. This line will help you improve your casting by letting you know when your form is correct. Technically, this is a line for ayu fishing rather than keiryu fishing, but it is the right size to use as a tenjo line for most of the keiryu rods I carry. 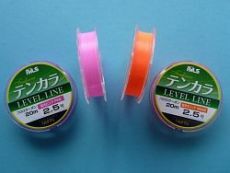 It is an extremely bright fluorescent orange, so it is much more visible than the clear or black lines that keiryu anglers use. It is thinner than 3X tippet, so it has little weight and minimal line sag. The tenjo line (translates as "heaven" or "sky" line) is the upper portion of a three piece keiryu line. It is hi-vis so you can get a sense of where you line is during the cast. It is thicker than your main line to reduce tangles and so that you should never lose it to snags (the weaker tippet should always break first). Attach it to your lillian with a girth hitch. I use between 3' for the 4.5m keiryu rods up to 6' for the 6+m rods. Tying a tippet ring to the other end makes attaching the main line easier. The middle portion of the keiyu line is the main line, for which you can use fluorocarbon tippet material anywhere from 4X to 8X, depending on the rod and how light you want to go. The markers are tied to this section of line. I tie a tippet ring to the end of the main line. The third portion of the keiryu line is the "hook length" (British term) or actual "tippet," to which the split shot is clamped and to which your hook is attached. 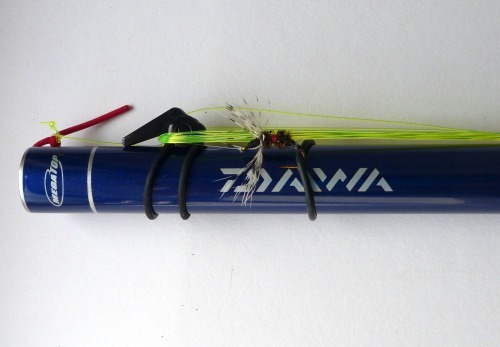 The Daiwa "Bright" markers come as 20 meter spools. Since you only use a few inches at a time, a spool should last well over a year. This is by far the most economical solution for Japanese keiryu markers. On the back of the spool there is a slit to catch the line. 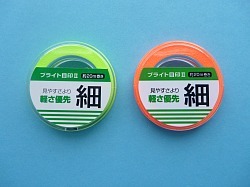 One revolution of the spool provides sufficient material to make three markers if you cut the tag ends short as they do in Japan. 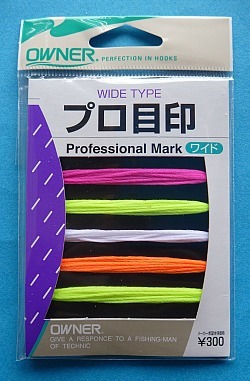 On the back of the package is an illustration showing how to tie the markers onto the line. The Owner Pro Marker package contains pre-cut markers in fluorescent pink, fluorescent yellow, white, fluorescent orange, and fluorescent chartreuse. Each pre-cut marker is about 3" long and is just knotted around the line. The TenkaraBum Tactical Nymphing Sighter provides unmatched flexibility to match sighter colors to the water and lighting conditions. Each line section has white, fluorescent orange and fluorescent chartreuse, with each color separated by opaque black. White is the most stealthy. If you have trouble seeing the white because of foam or white water, you can cut a sighter that is chartreuse over white, or orange over white or even orange over chartreuse over white. Use 0X or -2X fluorocarbon tippet material as your tenkara line, then the TenkaraBum Tactical Nymphing Sighter, then your regular tippet. 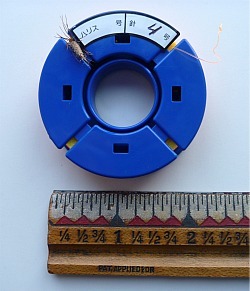 The .008" is very thin (equivalent to 3X tippet). It is the stealthiest but it is also the hardest to see against foam or glare. It is ideal for low clear water on a bright day, though. 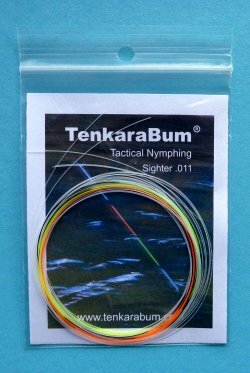 If you want to experiment with nylon as a tenkara line, there's no better way to do it than with the TenkaraBum Tactical Nymphing Sighter. 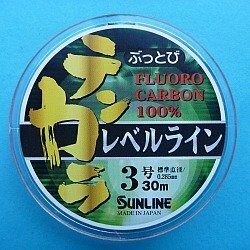 You might decide you prefer fluorocarbon. In that case, you still have very useful sighter material. The .013 sighter is Japanese size 4 line. The .011 is Japanese size 3 line. The .008 sighter is size 1.5, which is probably too small to bother with unless you fish with the Air Stage Hakubai 190. The sighters are shorter than you would want to fish with (except with the 190), but it is easy to tie two sighters together with a surgeon's knot, blood knot or back-to-back Uni knots. TenkaraBum Tactical Nymphing Sighter .008"
TenkaraBum Tactical Nymphing Sighter .011"
TenkaraBum Tactical Nymphing Sighter .013"
People really like the Fuji EZ Keepers as a way to manage your line when you move from spot to spot, or even to keep your rod fully rigged and ready to go at a moment's notice. 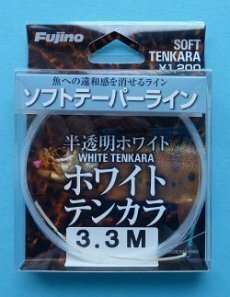 However, these small tenkara line holders offer some advantages, too. 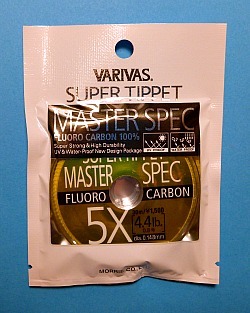 Varivas Master Spec is also available in fluorocarbon. 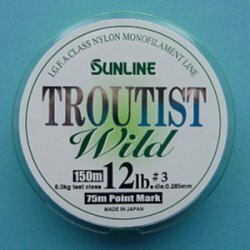 Although I generally use nylon tippets, many anglers prefer fluorocarbon when fishing wet flies and nymphs. Fluorocarbon's greater density does make it sink better than nylon, and the refractive index is much closer to that of water so fluorocarbon is less visible. 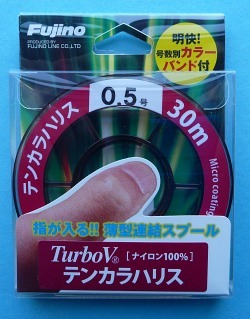 30 meter spool. 4X - 5.1 lb 5X - 4.4 lb 6X - 3.4 lb 7X - 2.4 lb 8X - 1.8 lb. 10X - 1.1 lb. 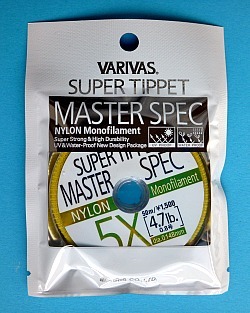 Varivas 10X tippet is for the truly obsessed. Use it for micro fishing or Zero Fishing, where you want the thinnest line possible. It is just 1.1 pound test, so you have to be very smooth. Just tighten the line, don't jerk! 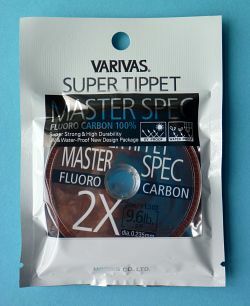 Varivas Master Spec Fluorocarbon tippets for carp fishing . The 5X tippet you use on your tenkara rod isn't going to cut it with carp. If you have a carp rod rated for heavier tippet, use it. 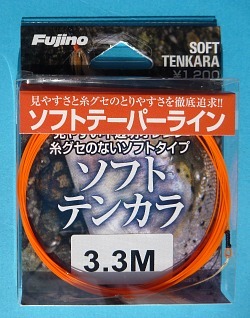 Tenkara Tippet by Fujino (probably the largest producer of tippet in Japan). 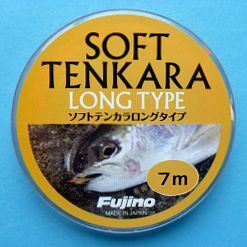 Sizes range from 3.6X (Japanese size 1.2), which is the maximum recommended by Nissin for most of its tenkara rods, through 6.5X (Japanese size .5) which is the maximum recommended by Suntech and Nissin for rods like the Kurenai, Air Stage and Royal Stage seiryu rods, the 450ZX soft and the Pocket Mini. 30 meter spools. Tippet rings are a handy way to tie tippet onto your line or to tie droppers onto you tippet if you fish with multiple flies. I especially like them for constructing keiryu lines, which consist of different diameters of very light line. 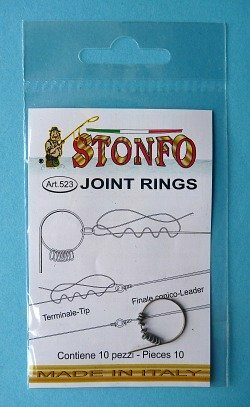 These are the tippet rings sold by Stonfo in Italy. They come on a very handy split ring so you can easily tie your line or tippet to the tippet ring before removing the tippet ring from the split ring. No more lost rings! I no longer sell the Horsehair Line Kit. 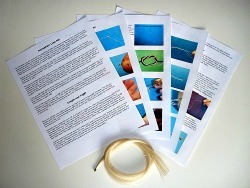 The full set of instructions for making a horsehair line are on the Horsehair Lines page.